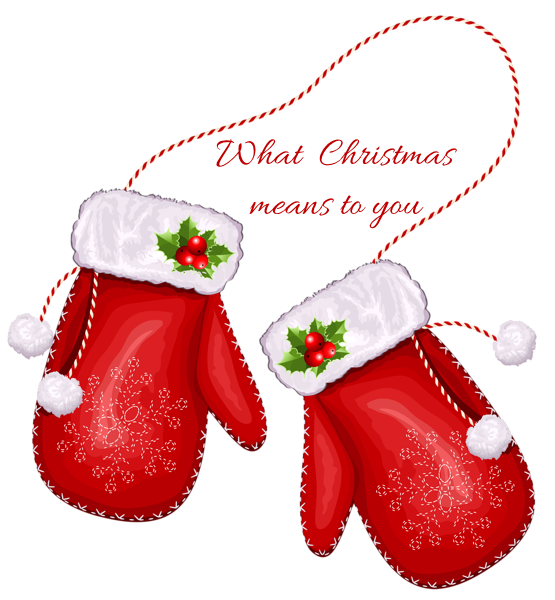 Diary of a Stay at Home Mom: Blogmas 2014 - Day 2 What Christmas means to me. Growing up, I can honestly say that to me Christmas was all about the presents. The one day in the year that I knew I would be looking at a Christmas tree surrounded by what seemed like a sea of gifts, and some of them were mine. As I grew older, I became wiser and really started thinking about what this day was about, and I won't lie and say that I still didn't enjoy the presents, but it definitely became more. I'm a Christian and so for me, Christmas means so much. It is the day my saviour was born, the day that changed everything. It is also a day about family and sharing and caring and enjoying each others company. Many many many years ago. 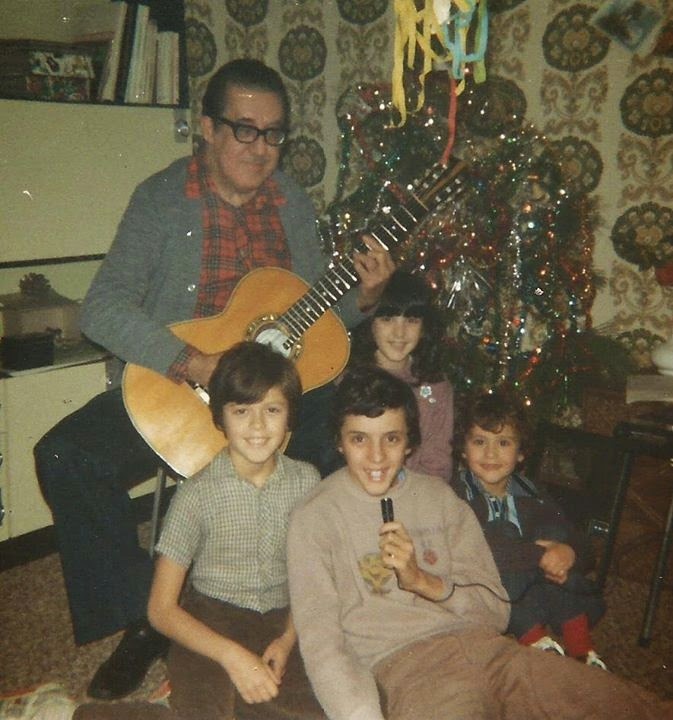 My grandfather was a guitar player for one of the biggest Fado singers in Portugal. Here he is at one Christmas with us in Portugal. 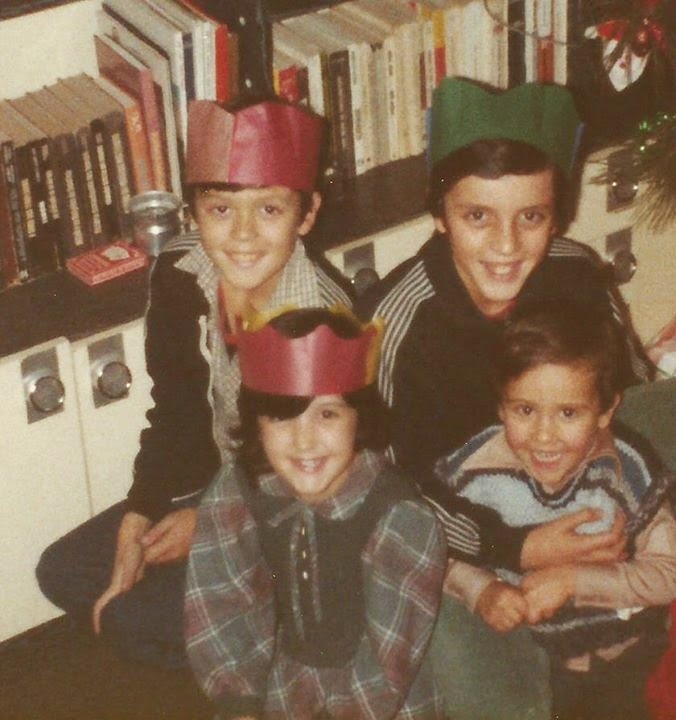 That is my brother Miguel on the bottom left, my brother Paulo, my brother Bruno and me in the background. I grew up in a very big family, we are Portuguese and get togethers meant a lot of people sitting around the table. At one point there were 15 of us, so you can just imagine that tree. I still remember one particular picture we took where my niece was a tiny baby, and we had put her between the presents. She looked so tiny in that sea of wrapping paper. All the family was there, my grandparents and uncles and aunts and brothers and dad and stepmom and greatgrandmother. So much love in one single room. But as the years have gone by, the family has gotten smaller as some have since then passed on, and it's never been the same. I miss the big family Christmas days, the loud noise, the voices talking excitedly, the mad dash to wrap that last one or two presents and get them under the tree, the little kids running around playing or sitting by the tree counting down the minutes. Though a lot has changed, for me, a lot has stayed the same. I try very hard to stay focused on what the season is really about and not to get caught up in the monetary side of things. It is NOT about the biggest and most presents you give or get. It is NOT about the amount of food you have at the table and it's not even about when you open the presents.......it is about remembering the beautiful little baby that was born in a manger and what he signifies for me. And it is also about the time I spend with my family, enjoying every minute and making each moment count. That is what Christmas means to me!!! I love how we are all digging out the old pictures - so cute! Reading your post made me think we could be cousins - our family get togethers were also quite large and all about togetherness. Hi Sandra! I LOVED the photos of you and your siblings when you were children. You are all so darn adorable!! Great post and great pictures. I love learning about how different countries and cultures celebrate. Sandra, loved your post about Christmas and the pictures of your family! Family...yes, that IS what is wonderful; getting together with family...and the reason for the season brings us to our Savior as a family! Love this post. BOY does your daughter look like you...only with red hair. I enjoyed seeing your childhood photos and hearing about your extended family. Beautiful memories. I agree, "Jesus is the reason for the season". Love the old pictures!! Thanks for sharing them!! My family is Polish and I have fond memories with aunts, uncles and cousins and Polish Traditions. Loved your photos and I loved this post too. We are alike in many ways. I've been wanting to join in but have been really sick this week so haven't been too motivated to do anything. Maybe next week I'll get it together. Until then I'll just enjoy everyone else's writings.